Stock brake lines are made of rubber which flexes under high pressure, especially when exposed to higher temperatures. As these parts age, the rubber will deteriorate and the amount of flex will increase leading to a soft and spongy pedal. Replacing the rubber lines with stainless braided lines will all but eliminate the flex in the system and provide a firmer, more responsive brake pedal. The stainless steel braiding keeps flex to a minimum while protecting the inner fluid passages from getting damaged by road debris. Stainless braided lines will also maintain the same pedal feel over their life as they not degrade over time like rubber parts. HEL Performance specialise in the manufacture of all stainless steel braided brake lines and hoses in over 60 countries around the world. Showoff Imports is official distributor for The Netherlands. Every modern car has compromises, normally instigated by accountants rather than engineers. One such compromise is the materials used for the brake hoses on your car. Rubber hoses or mild steel fittings are cheap but we all know how rubber hose bulges under pressure, allows brake fluid to absorb water vapour from the atmosphere and that mild steel fittings rust....We manufacture a complete replacement stainless steel brake line kit for any car which is fitted with a hydraulic brake system and as we only ever use stainless steel fittings for the automotive marketplace so we can offer the HEL Lifetime Warranty on all brake line kits. 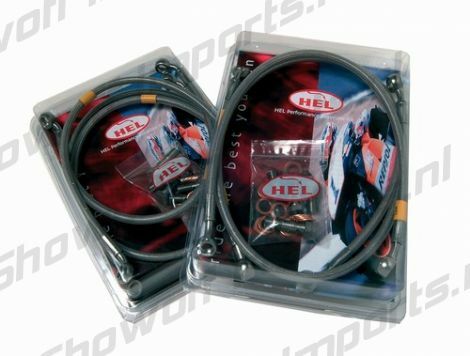 Manufactured to the highest possible industry standards exclusively by Hose Solutions, the HEL Performance car brake line kits are brand new to the tuning market, building on the worldwide success the product has had in the motorcycle market for the last 10 years, where HEL is the nr.1 brand available. There are no mild steel components in these kits at all - everything is stainless steel. 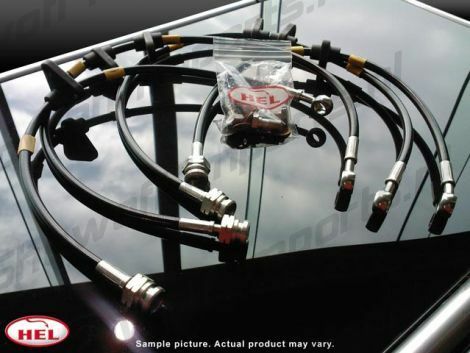 All HEL kits come with CNC machined stainless steel fittings, banjo bolts and new copper washers (where applicable), stainless steel braided teflon hose, and PVC protective wipe-clean sleeve. In our warehouse we normally stock and ship the stainless hoses with transparant sleeve as pictured above. On special order we can get almost any color of sleeves and banjo's. Most cars use 4 brakelines in their brakesystem, 2 on the front and 2 on the rear. Some cars use 5 or 6 lines, or even more. In the title of this product you can find how many lines are included in this set we offer. If it says (4x) or (5x) or (6x) you will get a set for the front AND rear! If it says (2x) you will get a set for the front OR rear (specified in title). If there is no number specified you will get a set for the front AND rear! I found the Honda Prelude 92-00 Stainless Steel HEL Brakelines 4x on ShowoffImports.nl and thought you might like it. HEL Performance specialise in the manufacture of all stainless steel brake lines and hoses in over 60 countries around the world. The most powerful part of your car is not the engine - it's the brakes. That's a fact! 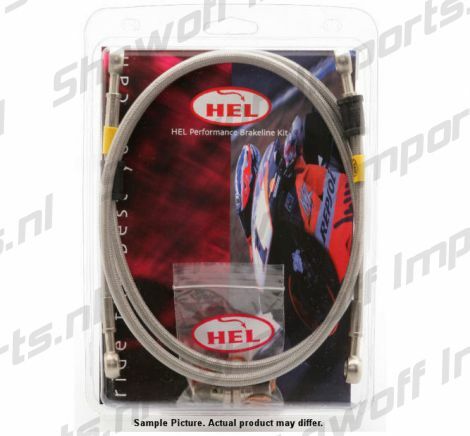 And by fitting HEL Performance Stainless Steel Brake Lines you can make them even more powerful, safer and longer lasting.